PLEASE NOTE: Due to increased demand at this time, some sizes may be backordered and may ship separately. If you have any questions, please contact us. Comfy, classic tee with inspiring screenprint message. Shaped fit. Heather grey cotton jersey knit. Imported. Hashtag, you’re it! Comfortable cotton tee with multi-color “HAVE ONE SHARE ONE #GIRLSCOUTCOOKIES” cookie screenprint. Rib-knit crew neck. Slightly shaped fit. Pistachio green. Imported. Every day is Earth Day when you’re a Girl Scout! Heathered trefoil-green scoop neck tee with cap sleeves. 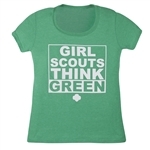 White square “Girl Scouts Think Green” screenprint design. Slightly fitted. Cotton/polyester. Imported. 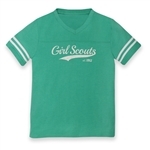 A “PROUD GIRL SCOUT ALUMNA” trefoil screenprint in white varsity-style font and navy body lends a collegiate quality to this V-neck tee. Cap sleeves. Slightly shaped. Cotton. Imported. The jersey-style football tee makes a fresh comeback in jade green. With “Girl Scouts Est. 1912” distressed varsity screenprint. Rib-knit V-neck. Top yoke. Double white stripes on sleeves. Oversized fit. Cotton/polyester jersey. Imported. Brighten up your game plan! 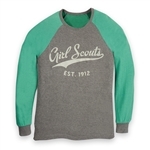 Granite grey baseball tee has sea green raglan sleeves and “Girl Scouts Est. 1912” screenprint. Cotton/polyester rib knit. Imported. Brighten up your game plan! 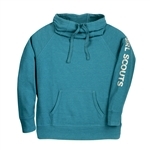 Granite grey baseball tee has sea green raglan sleeves and “Girl Scouts Est. 1912” screenprint. Cotton/polyester rib knit. Imported. Please note that this items runs a bit small. Ordering a size up is recommended. Lead the way! Heathered crimson-red tee is slightly fitted. A scoop neck and cap sleeves lend a feminine flair to its bold statement: Black and white distressed color block screenprint with “LEAD LIKE A GIRL SCOUT” and “#courage,confidence,character.” Cotton/polyester. Imported.